NEW YORK, NY – Evidence, A Dance Company will host its 10th Annual “On Our Toes… In The Hamptons” Summer Benefit on Saturday, August 17, 2013 from 4:00-8:00pm at the Hayground School in Bridgehampton, NY. The “On Our Toes…” benefit has become one of the premier cultural events of the Hamptons social season. The summer benefit will present a special performance of HIGH LIFE by the internationally acclaimed Evidence, A Dance Company. Choreographed by Founder and Artistic Director Ronald K. Brown, HIGH LIFE draws striking parallels of the Great Migration in the U.S. by depicting the journeys from the South to the North and from West African villages to the city. Evidence, A Dance Company focuses on the seamless fusion of traditional African dance with contemporary choreography and spoken word. “Evidence, A Dance Company is privileged to return for our tenth year to the Hamptons for our annual benefit,” said Evidence’s Artistic Director Ronald K. Brown. “We’re grateful for the tremendous support that we’ve received each year benefiting the dance company and our innovative community outreach programs.” Brown is the world-renowned choreographer of the Tony Award-winning THE GERSHWINS’ PORGY AND BESS. He recently choreographed a powerful new dance work, “Four Corners,” for Alvin Ailey American Dance Theater. Susan L. Taylor, a Sag Harbor resident and Editor Emerita of Essence Magazine, and her husband Khephra Burns, author, playwright and producer, will serve as the benefit’s Honorary Chairs. The power couple hosted the first benefit to showcase African American culture in the Hamptons. The Benefit Committee includes: Larry Satterfield, Board Chair; Gail Monroe-Perry, Secretary; Reginald Van Lee, Chairman Emeritus; Zaid Abdul-Aleem; Alvin Adell; Dwayne Ashley; Monica F. Azare; Reginald Canal; Spike Lee; Leslie Mays; James Sullivan; Jocelyn Taylor; and Dr. Ancy Verdier. The Young Patrons committee includes James Nixon and Curtis D. Young. Proceeds from the Hamptons Summer Benefit will support the dance company’s general operations and community outreach programs. Sponsor packages are $25,000, $15,000, $10,000, $5,000 and $2,500. Tickets are $350 and $500. For tickets and more information, please visit www.evidencedance.com or call Jacqueline McAllister at 718-230-4633; email, specialevents@evidencedance.com. 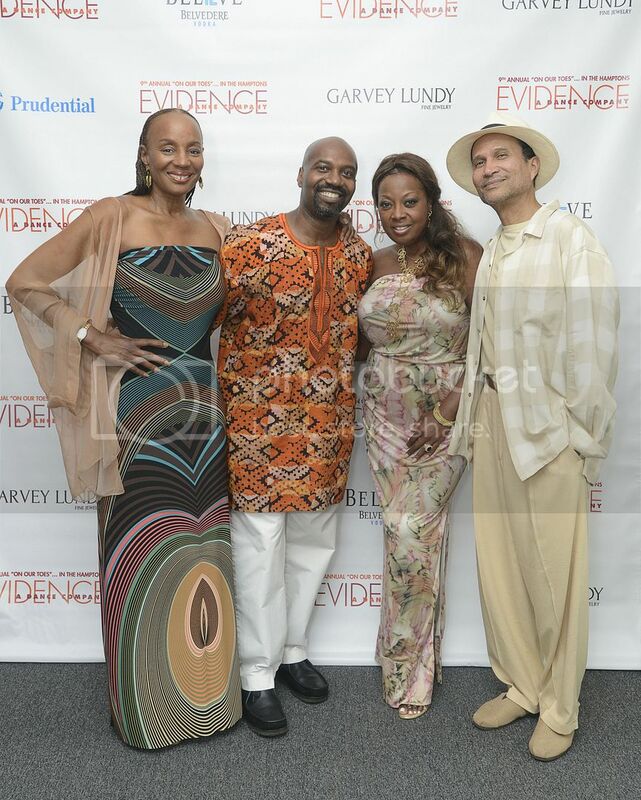 In photo: Susan L. Taylor, Evidence’s Artistic Director Ronald K. Brown, Star Jones and Khephra Burns at a previous “On Our Toes… In The Hamptons” Summer Benefit.